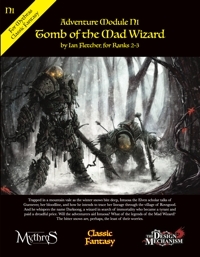 Your review will help other potential purchasers make their decision about whether to purchase Tomb of the Mad Wizard: Classic Fantasy Adventure Module N1. Please be as descriptive as you can with your review in order for it to be helpful to others. We will screen your review intially to ensure it is suitable for publication. Please do not use foul or abusive language, defamatory comments, or links to other websites in your review. We will publish both negative and positive reviews, as long as they meet our criteria for publication. Once you submit your review you will be returned to the main product page.